Bluming Inc. is an established Mechanical Design and a Product Development Company committed to the highest quality performance, innovative design solutions and on-time delivery. At Bluming Inc., we specialize in working with uniquely different clients and adapting to the ever changing and a very competitive manufacturing industry using only the newest technology and 3D CAD software. We have experience in all aspects of design, from concept through prototype, to mature production documentation, along with the extensive knowledge of a variety of fabrication techniques, materials, ISO and ANSI standards. 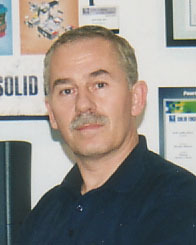 Prior to establishing Bluming Inc., Miroslav Mitrovic had an extensive mechanical and electro-mechanical engineering background. Besides his post-secondary degree in Mechanical Engineering, Miroslav has taken several courses and seminars in CAD programs that have increased his knowledge of and interest in that type of design. He is the first in Canada to acquire the Solid Edge Professional Certificate at the Solid Edge Global Summit held in Atlanta, Georgia. There, he was also awarded the User Choice Grand Prize Award at the Fourth Annual Solid Edge Design Contest (2001). At the opening of The Solid Edge User Group of Ontario, he won the design contest in sheet metal for having the fastest time at J-Squared Technologies Inc. He has also worked on projects for military helicopters and fighting jets and his design was featured and awarded at the International Fair INOST'94 in Bosnia. Miroslav's various projects have been published all over the world and his highly regarded reputation in the Toronto, Canada area afforded him the ability to successfully establish his own design firm.